That’s right, I’ve been having Fun! With! Felt! In my head I’m saying this like Sheldon’s intro to “Fun With Flags“. Simplicity got in touch with me to see if I wanted to help spread some festive cheer. I was allowed to pick any of their holiday-themed patterns to sew and I’m here to share the results with you all. I was so close to picking Simplicity 2495 – but I got scared of showing my terrible embroidery skills. Instead I went for Simplicity 1516! I’m going to show you my makes over two posts. Today I’ve got the cutest Christmas Tree Ornaments to show you. 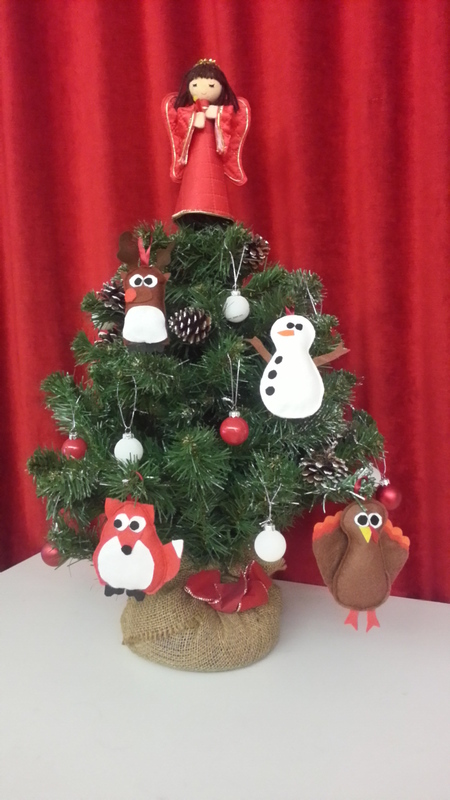 This pattern includes templates for the following festive felt decorations: a tree skirt with snowflakes and happy characters, a stocking with pocket, and hanging ornament animals including a squirrel, bear, fox, snowman, moose and owl. There’s also the suggestion to turn the animals into wall hangings. 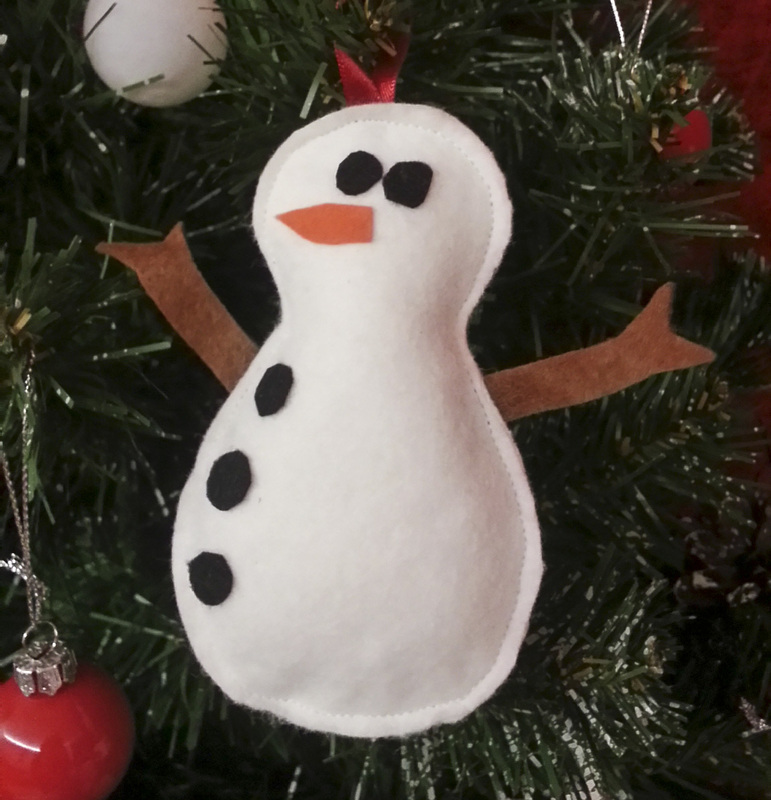 First up – Mr Snowman! With cute coal eyes/buttons and a carrot nose. I especially love the stick arms. Next, Fantastic Mr Fox! With shifty fox eyes and nifty fox feet. This might be my favourite. Now because I don’t like to follow rules you’ll see I’ve made a few adjustments. Here is Gobblett the Turkey! I made him using the body and eyes of the squirrel. The feet are the arms of the snowman. I drafted the tail fan, beak and wattle. 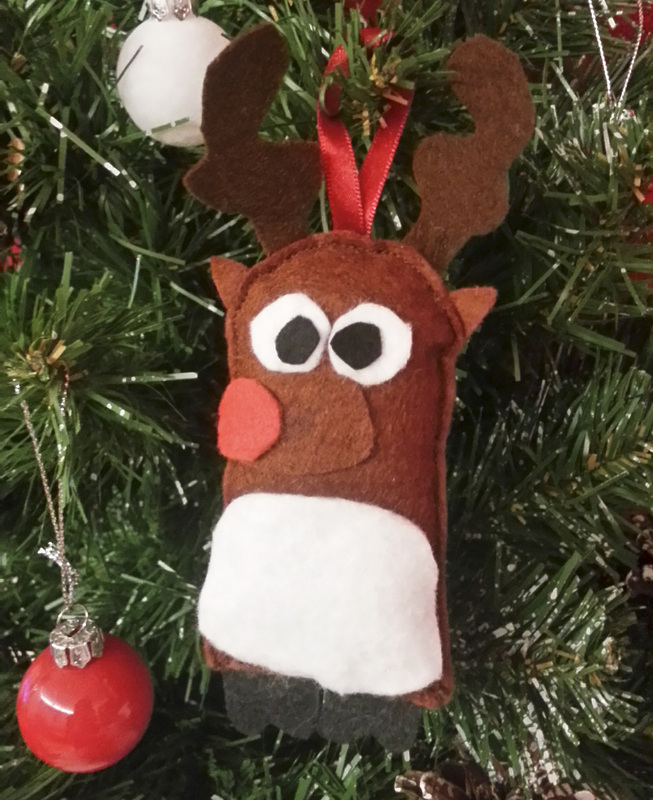 Finally here is Rudolph! This is the body, nose, eyes and antlers of the moose but with a self drafted belly and red nose. I also tweaked the shape of the antlers a smidge. All these characters were made with felt, pva and machine stitching, though they could easily have been hand-stitched. I used wadding to plump them out a little but they barely took any stuffing. All the arms, legs and ears are caught between the two layers of ornaments so they look as good from the back as they do the front. The beauty of these little critters is that they can be a completely child-friendly make. 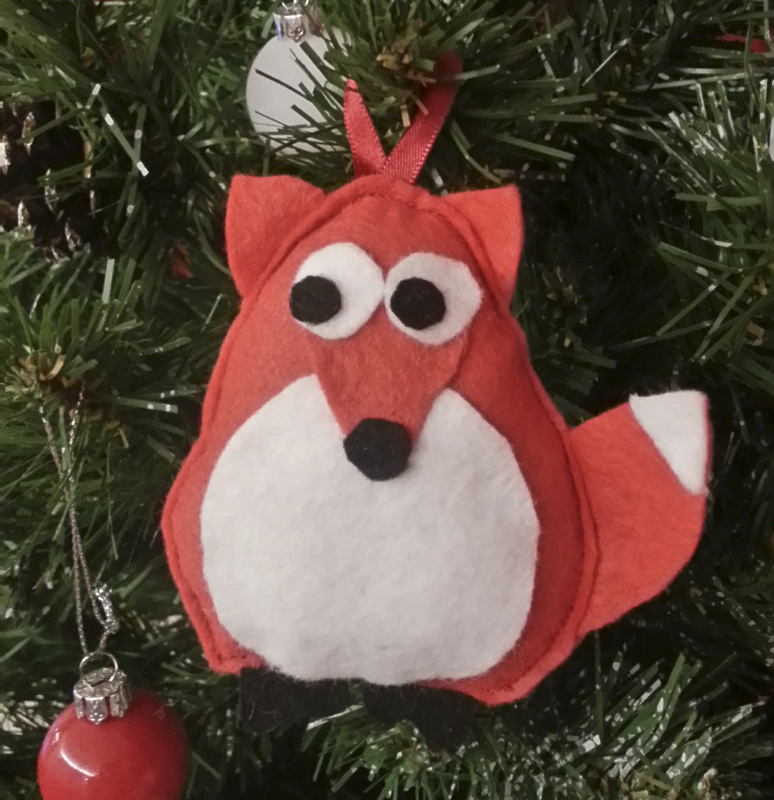 What kid wouldn’t like to sit at a table and make animal ornaments with goofy faces?! 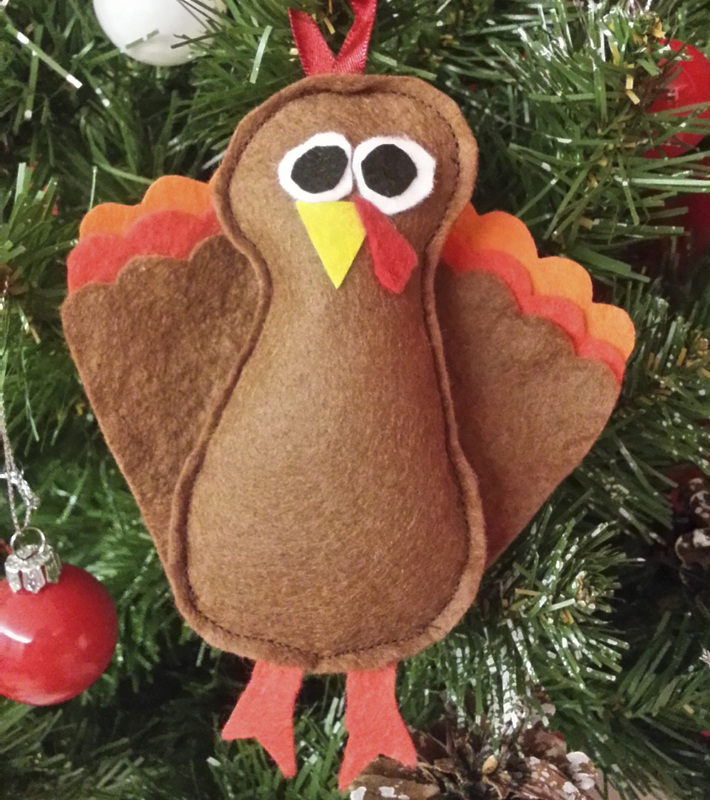 A supervising adult could help stitch them up and then pass back to the kids for stuffing. If your child is a little older and trustworthy, they could quickly use a running or blanket stitch round the outside to assemble the bodies. The patterns pieces are colour coded (see above – 10s, 11s and 12s) so you know which pieces need to be cut out of black, white, etc. 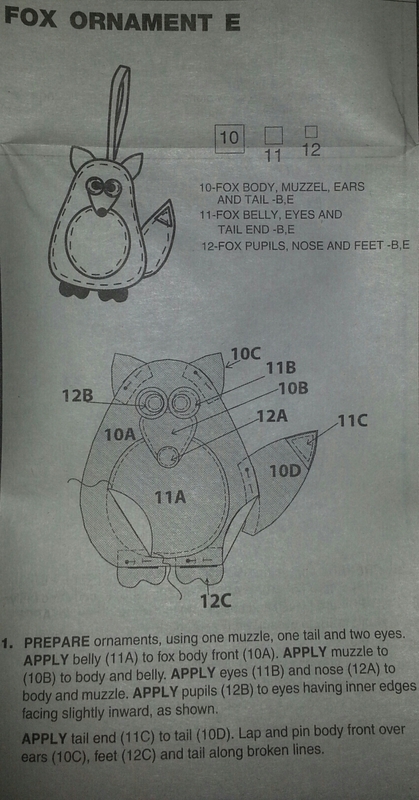 Everything small is provided twice to cut single-fold, so you get two mirrored feet, antlers, etc. Word of warning: the eyes, pupils, and nostrils are pretty darn small and you could probably just wing them freehand. Soon I’ll be back to show you the stocking I’ve made to put some small gifts in for my family and a tree skirt that will be going round my parents Christmas tree (rather than my hilarious small one). What do you think? Are you smitten? Or not a fan of felt ornaments? These are so cute! Your tree looks so festive! They look great Amy!! Can’t wait to see the rest. I didn’t even know tree skirts existed until recently and I saw a load on Sew Mama Sew 😀 I’m still not really sure on their purpose but they look pretty cute. Full on handmade Christmas gift making in progress here!! They look great! I’ve been thinking of making my own tree decs this year you’ve inspired me to get on with it! Great that they are child friendly too! Love it! They are all brilliant! I love the fox, and your angel is fab. That’s cute. I love the turkey, good creative thinking! But that shifty-eyed fox is definitely my favourite.